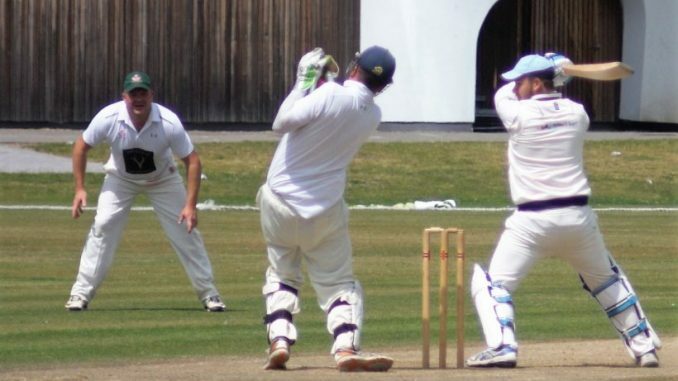 As the season reached the halfway point, Broadstairs 1st XI suffered just their third defeat of the season as they struggled to cope with the star-studded bowling attack to the hosts, Folkestone CC. With Kent professionals Mitch Claydon opening the bowling attack, Chris Flint and Elliot Fox got the Broadstairs innings off to a solid start, reaching the respectable score of 36-0 off the first 10 overs. However, the tide turned when James Tredwell, Andy Allon and Craig Colemen replaced the opening bowlers and run-scoring opportunities seemed to vanish. When Fox was dismissed(13) playing-on to a delivery from Tredwell, Isaac Dilkes came to the crease and he and Flint worked hard to try to take the innings forward. However, when Flint (34) was dismissed, the score had just crept to 57 and remained there with the fall of two further wickets – Dilkes (5) and Swaroop Dasari (0). Three further wickets (Jack Wheeler, Alfie Huntley and Sam Winsor) fell in quick succession and the visitors had to rely upon the partnership of Scott Narraway (20) and Matthew Frewin (13) to bring some respectability to their total, moving the score onto 95-7. However, a second mini-collapse followed and Broadstairs finished all-out for 106, with more the 6 overs remaining of the possible 50. Although it was clear that something remarkable would need to happen for the visitors to defend such a low total, there was some hope when Jamie Dewell removed both opening batsmen with the score on 15-2. However, the second dismissal brought Tredwell to the crease who was not going to let victory slip away. Although Folkestone were to lose one more wicket, courtesy of Frewin, they cruised to victory in the 24th over. The defeat means that Broadstairs now find themselves in 5th place in Division 2, only 10 points behind the leaders. With the top two teams playing each other next week and Broadstairs away to fellow challengers Upchurch, a return to winning ways provide a major boost to their promotion hopes.